There is no doubt that knowing the terms used during the gameplay makes the game more interesting. This is not only true for online craps in South Africa, the trend is the same in all the other casino games and with players all over the world. Despite the fact that knowing the “game Lingo” will essentially not improve your chances of winning it is useful to know. Even if only to avoid looking confused at a Craps table. Something that you never have to worry about when playing at online casinos. Pass line and Don’t Pass bets. Players are required to place bets on whether the dice will pass or win. The pass line bet is determined by the came out roll. The come out roll is when the shooter rolls the dice to determine whether the pass bets win or it loses. Shooter, this is the player who has the responsibility of rolling the dice. This player throws the dice against the opposite wall. The outcome of the dice roll can be a Natural or Craps. These are the best and worst scenarios respectively, there are other outcomes besides these two. Natural and Craps: A Natural is a dice outcome of 7 or 11 in the first dice roll of the game. When this happens the Pass line bet Wins. Craps is when the Pass line bet losses, so appropriately named. Unless if you are the Wrong Bettor. A dice outcome of 2, 3 or 12 is craps. Point: a point is a digit that is played in the come-out roll, it is any number excluding 2, 3, 7, 11, and 12. That numeral will then be the pointing digit for the round of the game. Don’t Come Bet: betting that seven will show before the point is recognised again. Snake Eyes– this is when both dice have an outcome of one. You can get paid for this outcome by playing a bet on Aces. Yo-leven– sometimes shorten to just Yo is when the total dice outcome is 11. Hardway Bet-this is betting that an outcome of 4, 6, 8 or 10 is formed by pairs. But the bet pays out only when the outcome comes before a 7 or easy way. Easyway Bet-the outcome of the dice can be 4, 6, 8 or 10 for the bet to pay out. However, the dice cannot display the same numbers. 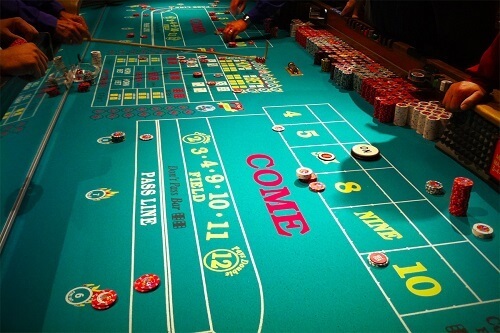 Find out more about craps and its history.